this gobi biryani recipe is a one pot recipe of a dum cooked south indian style cauliflower biryani recipe. rinse 1.5 cups seeraga samba rice (280 grams) 3 to 4 times in water. then soak rice grains for 30 minutes in enough water. after 30 minutes, drain the rice and keep aside. next rinse and then chop 1 small to medium cauliflower in medium sized florets. you will need about 3 cups of cauliflower florets. take the florets in a bowl. add hot boiling water till it cover the cauliflower florets. also add ¼ teaspoon salt. keep aside for 5 to 6 minutes. blanching the cauliflower is to get rid of the worms or insects. this step is optional. to get rid of the cauliflower aroma, you can add ½ teaspoon vinegar in the hot water and mix it well before adding gobi florets. meanwhile prepare the spice paste or masala paste. take all the whole spices mentioned above in the list 'spices to be ground' in a small grinder jar or chutney grinder jar. also add desiccated coconut, green chilies, ginger, garlic and coriander leaves. add ¼ cup water and grind to a smooth paste. keep the spice paste aside. heat 3 tablespoons oil in a thick bottomed heavy pan or pot. add ½ cup thinly sliced onions. begin to sauté onions on a low to medium flame till they turn golden. then add 5 to 6 curry leaves and 1 cup finely chopped tomatoes. mix very well. cover the pan and cook the tomatoes for 4 to 5 minutes on a low flame, till they soften and become mushy. in between do check a couple of times and stir, so that the tomatoes do not stick to the bottom of the pan. then add the ground masala paste. mix and sauté for 1 to 2 minutes. then add a pinch of turmeric powder and mix again. now add the blanched cauliflower florets. mix the cauliflower florets with the rest of the masala. then add the rice and gently mix the rice grains with the rest of the ingredients. add 3 cups water. next add 1 teaspoon lemon juice and salt as per taste. check the taste of the water and it should have a slight salty taste. stir well. seal the pan with an aluminium foil. now cover the pan with its lid. you can even directly keep the lid on the pan without using the foil. since this lid has a vent on it, i have sealed the pan with the foil. dum cook gobi biryani for 18 to 20 minutes on a low flame or sim. do use a thick bottomed heavy pan or else the base can get browned or burnt. if doubtful, then keep the pan on a hot heavy tawa (griddle) which is placed on the burner and cook on a low flame. give a standing time of 6 to 8 minutes. then open the lid. gently fluff the cauliflower biryani and serve hot. garnish with coriander leaves while serving gobi biryani. 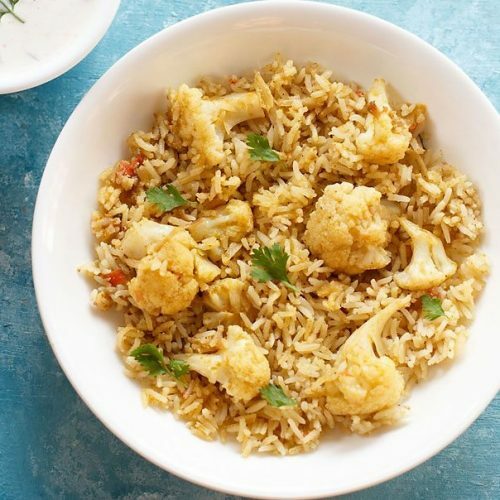 serve any raita or salad of your choice with this cauliflower biryani. instead of seeraga samba rice, you can use any indian variety of fragrant rice. add more green chilies for a spicy taste in the gobi biryani. do use a thick bottomed heavy and deep pan or pot, so that the rice does not get burnt while dum cooking. blanching cauliflower is an optional step and you can skip it. skip poppy seeds and stone flower if you do not have them.